Saving money on water costs is a goal of many homeowners. Unfortunately, many people in the Valley Village area live in homes that are several decades old and may still have the original kitchen and bathroom fixtures. Although these faucets may still work relatively well, a simple upgrade could help you conserve more water and save more money. Today there are plenty of eco-friendly shower faucets and sink faucets that are made to use minimal amounts of water without sacrificing water flow. These fixtures are sleek and modern giving any bathroom an instant facelift and reducing water. It’s a win-win situation. Ask your Valley Village plumber about the benefits of eco-friendly bathroom faucet installation. How many times have you turned on the kitchen faucet while cooking and walked away from it while it is still on? A lot of people opt to leave the faucet running while they are prepping meals so they don’t touch the faucet with meat-soiled hands. While this may be the sanitary thing to do, it certainly isn’t doing you any favors in terms of conserving water. An alternative to leaving the water running is to install a no-touch kitchen faucet. These faucets have a sensor that detects motion and turns the water on only for the time that your hands are in front of the sensor. These faucets are similar to faucets found in public restrooms. Lastly, the best way to conserve water is to fix a leaky faucet. Taps that drip waste as much as 200 gallons of water in a 24 hour (depending on the drips per minute rate). A leaky faucet can also lead to additional plumbing problems that may require costly repairs. If you want to save money, don’t ignore a broken faucet. Get bathroom and kitchen faucet repair at your earliest convenience. For more information about replacing kitchen and bathroom fixtures with eco-friendly options, call Valley Village Plumbing & Drain today. Our licensed and bonded plumbers are experts in green plumbing solutions and are available 24 hours a day, seven days a week. Waste water is emitted from the house through a lateral line. This line links the drain to the main municipal septic tank, cesspool, or sewer. With time, lateral lines can be cracked or damaged by shifting soil or tree roots invasion. The staff at Valley Village Plumbing & Drain can help remove tree roots from your sewer line so that you do not experience problems associated with tree roots invasion of your sewer line. In addition, we advise our clients on the types of trees whose roots can invade their sewer lines. Different tree species have distinct root systems. Some trees have root systems that stretch down and outward mimicking the growth of the tree above ground. The roots may be as broad as the canopy of the tree and as deep as its height. When constructing a new septic tank system, make sure there are no trees within 100 feet of the sewer line, especially trees with destructive roots. Cottonwoods, poplars, and aspens have large wide spreading root systems. These trees can cause significant damage if planted near drain fields, home foundations, septic tanks, driveways, or sidewalks. They have invasive root systems that help the tree survive in its natural surroundings. However, they can invade sewer lines and cause plumbing problems. Elms are grouped into two: deciduous and semi deciduous trees. American elm is a common landscape tree grown along city streets, in home landscapes, and in parks. Elms offer a nice shade and visual appearance but should not be grown near pipes, septic tanks, or any other plumbing feature. They have deep and extensive roots that can invade sewer lines and cause blockage. Willows develop extensive, destructive root systems that viciously seek dampness. They can cause major problems to plumbing systems if planted close to a septic tank. These trees should not be planted near water mains, septic tanks, or foundations. However, they provide an elegant accent when planted along ponds or riverbanks. Valley Village Plumbing & Drain provides recommendations for tree species that can be planted near sewer lines. 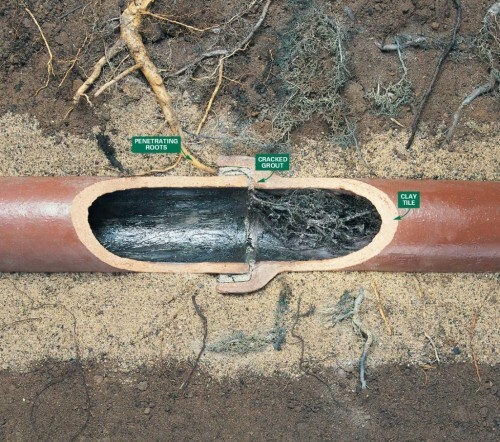 We can also help homeowners deal with root invasion of their sewer lines. Call us today to schedule a consultation. My Valley Village Plumber Hero is a plumbing referral service provider that works in partnership with established, licensed, & highly rated plumbers based in Valley Village, Ca. We reserve the right to refer any service call to a qualified Valley Village plumbing partner.